Tongue scraping is beneficial for removing impurities from the tongue that may accumulate during the night as well as stimulating the digestive system and improving circulation and taste perception. Method – Hold the tongue scraper at either end; drag the centre along the tongue from base or back of the tongue to the tip. Wash the accumulated residue offunder a warm running water and repeat several times. Be careful not to apply too much pressure on the tongue, just gentle strokes. Ginger is also known as “Vishwabeeshaja meaning the universal medicine” as it has broad range of health promoting qualities. Fresh ginger taken in the form of tea first thing in the morning upon rising aids in awakening the digestive system and moving undigested and stagnant residue from the body’s resting phase and lowered metabolic rate. When combined with lemon it becomes a potent but gentle daily detoxifier. Ginger is also well known for its anti-inflammatory action that may aid in joint care and improve circulation. Contra-indication – during pregnancy, heartburn and ulcers. Method - Combine 1 teaspoon of freshly grated ginger with a cup of boiled water, add 8 drops of lime in hotter months or lemon in colder months, infuse for 3 to 5 minutes. Jala neti is a form of yogic cleansing performed by administering saline solution through the nasal cavity. This procedure helps remove impurities from the nasal cavity and sinus’s. It is effective in preventing conditions associated with ears, nose and throat as well as invigorating the mind and sense organs. Method – Combine the salt to water and stir until salt dissolves. Fill the neti pot with water. Leaning over a sink tilt your head forward andtilt to the right side. Place the spout of the neti pot on the right nostril to ensure a seal is made with the spout and nostril. Slowly tilt the neti pot and pour water so that saline solution enter right nostril and exits via left nostril. Continue until contents of neti pot have passed through nostrils, gentle blow your nose and expel any loosened mucus and repeat on opposite side. Gently warm the oil to above body temperature by placing the bottle in hot water in a saucepan or under hot running water for a minute or so. Have some old towels on the floor to avoid messy spillage and make sure there are no drafts coming into the room. Starting with the top of your head and using the flat of your hand, massage gently over scalp, outside of ears, over face, following the contours of the bones, then the neck, paying attention to the back of the neck.Then working down the body, use round massage movements over the joints and long massage movements over the long bones. Work very lightly over the heart area, but firmly over the abdomen, massaging in the direction of the colon (i.e. clockwise as you look down).Massage as much of your back as you can reach, then work down the thighs and legs to the feet.Pay special attention to the feet, spending at least a third of the total time on them. (If possible, leave the oil on for some time – e.g. 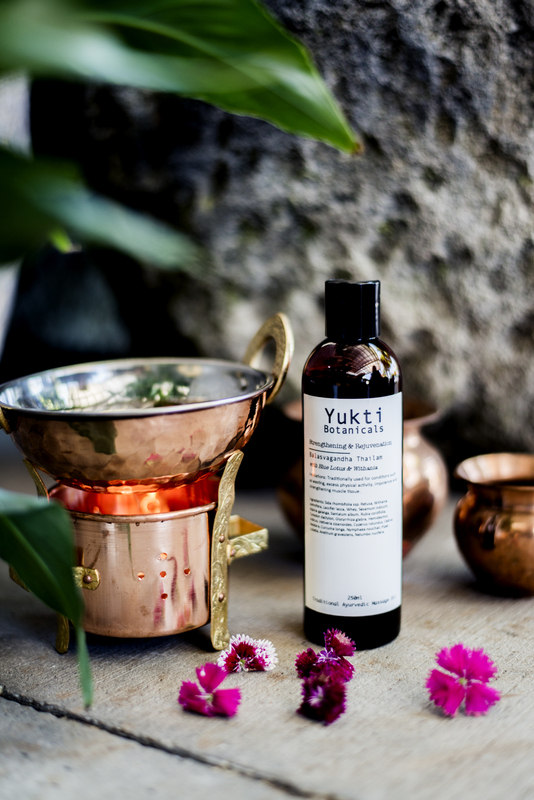 whilst doing yoga or other exercise)Then wash off the oil with a mild soap in a warm bath or shower and pat yourself dry. 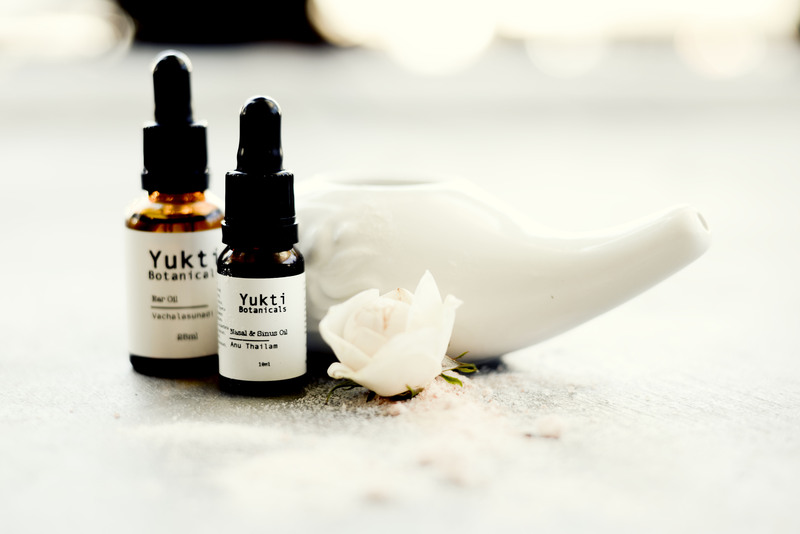 Purchase your Yukti Botanicals Ayurvedic oils ​here. Daily abhyanga has a beneficial effect.As a morning ritual, it can settle the mind and stimulate the body.At night it can be used on the feet only, to settle the whole system and ensure a good night’s sleep.If you have a lot of Pitta in your system or the weather is a very hot, coconut oil (uncured) can be used instead of sesame oil, until you cool down again. BE VERY CAREFUL stepping in and out of the bath/shower to avoid slipping. Put on warm clothes after your bath/shower.Warmth will help the assimilation of the oil. Put on socks to protect your carpet from oil stains. Nasya is the use of various medicinal substances administered through the nasal route. 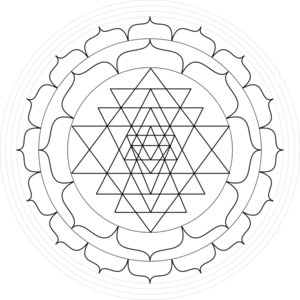 There are many different forms of nasya therapy however require a trained Ayurvedic professional for administration. Pratimarshana nasya is a safe practice that can be used daily to protect and strengthen the eyes nose and ears and prevent disease that affect these areas as well a wide range of other health promoting benefits. Nasya can be done just after a shower in the morning due to exposure to steam. Contra-indications – Head colds, rhinitis, congestion, excessively wet cold times of the year. Nasya can be very affective for these conditions however require administration from a trained professional. 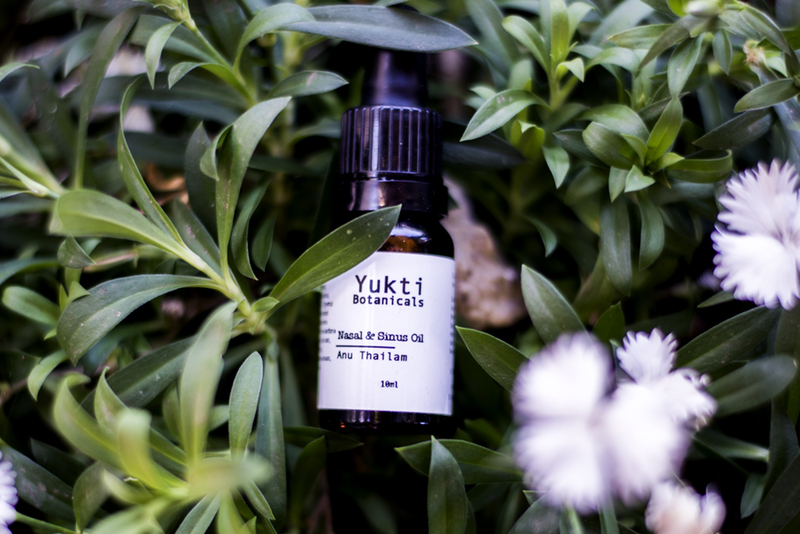 Method – Place two drops of oils just inside each nasal cavity and gently massage. Make sure nails are well groomed to avoid irritation. This procedure involves gargling and swishing medicated substances or oils in the mouth for a certain period of time. Gandusha is used in both healthy and diseased conditions. Some benefits of Gandusha include feeling of lightness in mouth, normal functioning of sense organs, strengthening teeth and gums, improving taste perception and cleansing the oral cavity thuspreventing conditions such as gingivitis. Method – After warm shower place 1 tablespoon of medicated or cured sesame oil. Gargle and swish liquid between throat, cheeks and front of mouth. Continue swishing for 20 minutes then discard liquid. 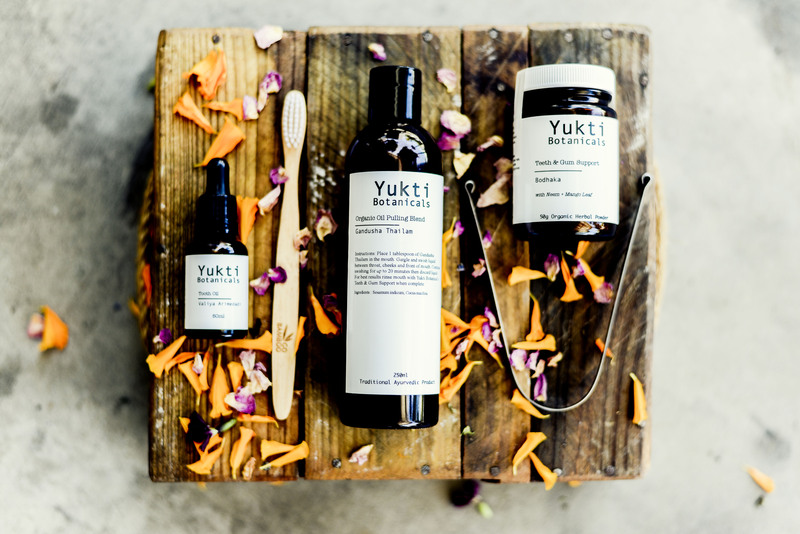 For best results rinse mouth with Yukti Botanical’sBodhaka - Teeth & Gum Support when complete.